Players Championship: Rory McIlroy makes late surge to join Tommy Fleetwood in halfway lead. 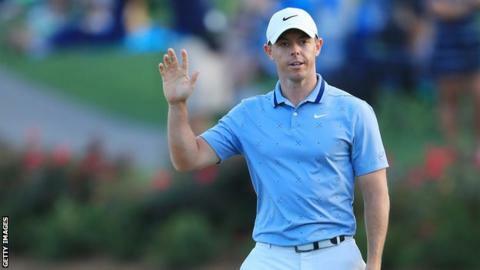 Rory McIlroy made an impressive late surge to join Tommy Fleetwood in the lead of the Players Championship on 12 under after round two at Sawgrass. The Northern Irishman made three birdies and an eagle on the back nine to card a superb seven-under-par 65. England's Fleetwood had earlier hit a 67, making five birdies and two bogeys and also holing a bunker shot for eagle on the second. "I need to just keep doing the same things," McIlroy told Sky Sports. "It didn't happen for me last week but I did so many good things and it's been nice to be playing with confidence." McIlroy and Fleetwood lead a group of four players, including Englishman Ian Poulter, by three shots in Florida. Four-time major winner McIlroy is chasing his first PGA Tour win since the Arnold Palmer Invitational in March last year. "I felt really comfortable and I enjoyed it," he added. "I'll try to keep that focus and commit. Two rounds is a long, long time but I've put myself in a good position." Poulter hit a 66 that featured an eagle, seven birdies, a bogey and one double bogey to finish on nine under. He is joined by Mexican Abraham Ancer and Americans Brian Harman and Jim Furyk, who shot a brilliant 64. World number one Dustin Johnson is on seven under after a 68 while compatriot Keegan Bradley, who shared the overnight lead with Fleetwood, slipped back to six under after a 73. Scotland's Russell Knox is also on six under, two strokes ahead of world number two Justin Rose, who recovered from a first-round 74 with a 66 on Friday, while fellow Englishman Eddie Pepperell is also on four under. Tiger Woods is a stroke further back after carding a 71 that included a quadruple bogey at the par-three 17th when the 14-time major winner hit two balls in the water. "I was pretty ticked," he said. "I was determined to get it all back. Elsewhere, Englishman Matt Wallace, who is writing a daily diary for BBC Sport, is on two under, while compatriot Matthew Fitzpatrick is a shot ahead. Several big names missed the cut, which was set at one under. Henrik Stenson and Jordan Spieth both finished at one over, with Tyrrell Hatton, Danny Willett and Phil Mickelson three shots further back. Paul Casey could not recover from an opening-round 78 and ended on eight over. The BBC Sport website will have live text updates of Saturday's third round and Sunday's final round from 18:00 GMT on both days.